There’s a lot of misinformation about attic ventilation, so we wanted to take a moment to clear up any confusion about how you should be venting an attic and what you need to do it right. 1. If I have roof vents, I have ventilation. If only it were that simple! 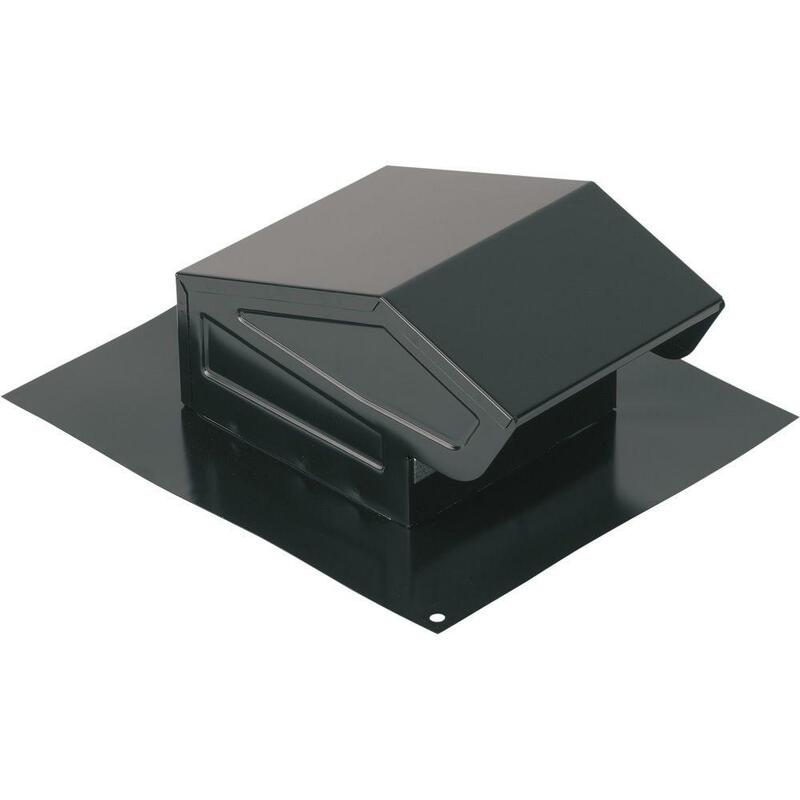 Attic ventilation should have a balanced amount of both air coming in to the attic and air exiting the attic. (It’s ok if you have a little more air coming in than you do going out. For example, lots of soffit venting.) The main way air enters attics is via soffit venting. These vents allow cool, dry air to enter the attic at its lowest point and as air travels up and out the higher points (ridge, turbine, gables) so that the airflow removes warm, moist air from inside the attic. 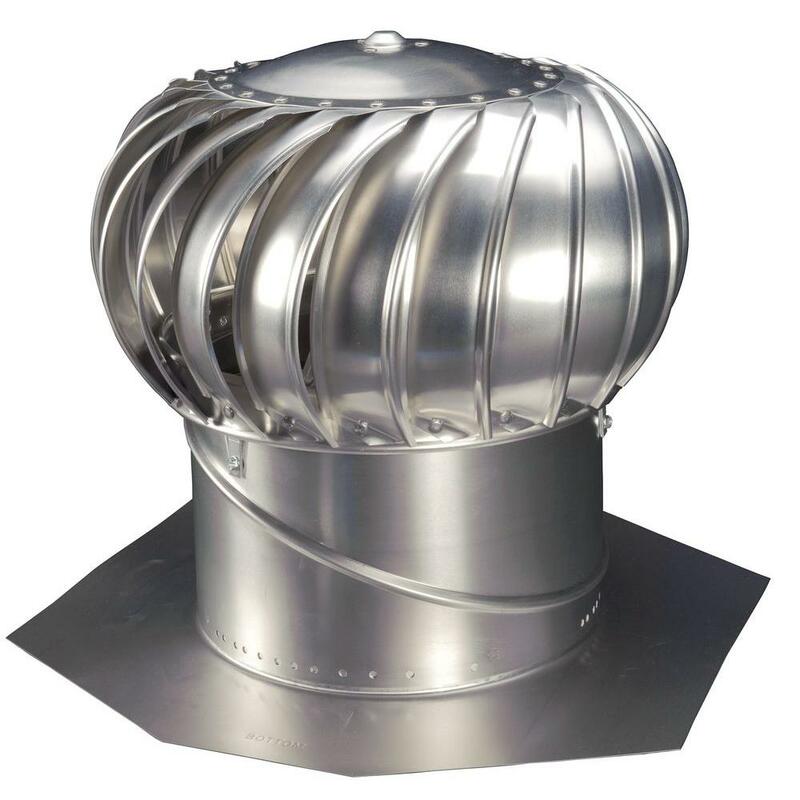 For exhaust you can have a ridge vent, a static roof vent, a turbine (whirly bird) vent or gable vents. Some people have powered attic fans or solar fans, and those are ok too. Just beware of mixing passive and active venting in an attic – that’s a bad idea! Too much of a good thing can be a bad thing. I recommend you choose one type of exhaust vent and go with it. Ventilation is simple because air always travels the path of least resistance. When you mix exhaust vents on a roofline, the strongest vent will overpower any passive venting and then pull air in from any nearby exhaust vents! This disrupts the normal path of of air coming in the bottom and out the top and defeats the whole purpose of having low/high vents. So while it’s generally a great idea to have plenty of soffit vents for intake, having too many exhaust vents or mixing exhaust vents can counteract your goal of cooling the attic air temperature. This idea flows from the one above and I’d just like to reiterate that a passive ventilation system will work just as well (and for free) as a powered (active) ventilation system. You’ve heard me say that I don’t typically recommend the use of any sort of powered fans and the top reasons why I feel that way, besides that they work just as well as passive vents, is because of 1) cost, 2) noise, and 3) some only work on sunny days! Many people may not realize that it’s usually fairly breezy at the top of a roof. Standing down on ground level, you’re blocked by fencing, homes, etc but up top without obstructions, there’s a good amount of air flow. Just a little breeze moving can turn wind turbines and allow them to effortlessly pull out as much air as an electric fan can. What if you already have fans? Not to worry! Again, fans work and won’t be a problem as long as you feed the fans with plenty of intake air. So take some time and check on your soffit vents. If they’re not cut out, get them cut out. If they’re blocked, clear the path and maybe install some baffle vents. If they’re dirty, clean them! Dirty soffit vents are actually the leading cause of attic ventilation problems and so much so that I made a video to help show you how you can clean them yourself and get things back on track with airflow in the attic. Don’t neglect giving the fans a source of intake because without it, the air in your attic will depressurize and it’s likely going to result in air from inside your home getting pulled into the attic space via light fixtures or other ceiling penetrations. The net result is that your home feels warmer faster, and your air conditioner has work harder than ever just to try to keep things comfortable (ie. huge energy waster!). To find out about ventilation myths 4 – 6, click here to check out the complete article over on AtticFoil.com. Original AtticFoil® is an amazing product – it blocks over 97% of radiant heat, it’s tear-proof and it is heavyweight and easy to use. Many of our customers install the foil by stapling it up under the roof rafters, creating a sort of ceiling. This is most common in Souther states where air conditioning ductwork is typically installed in the attic. This method is great for reducing radiant heat gain into the attic in hot climates. However, we also have many customers in cold or mixed climates that were looking for benefits from our foil both in the hot summer and the cold winter. The solution to a climate zone like this is to lay the foil on top of the insulation (as long as the attic space doesn’t have any HVAC components or tons of storage, otherwise a hybrid method would be best). The over-insulation install method allows the foil to still block radiant heat coming off the roof in the hot months but it also keeps the insulation warm in the cold months, making the home stay more comfortable and energy efficient. Although the original AtticFoil® does a great job of allowing moisture to pass through its micro-perforations, there are some circumstances where the moisture level could be exceptionally high and water could get trapped. Keep in mind that this is a rare occurrence; however, the FEAR of trapping moisture has caused many people to be hesitant about installing a radiant barrier directly over their insulation in cold or mixed climates. SuperPerf™ is a customer driven product; we had many customers tell us, “I want to install a radiant barrier, but how will I KNOW it won’t trap moisture?” Unfortunately, every home and circumstance is different and we just couldn’t make that promise with our original product. With that in mind, we developed an exclusive foil barrier product that not only offers the same reflectivity (97%) as our original foil, but it also offers the added peace of mind of not trapping moisture. We call this product SuperPerf™ because it has larger perforations than our original. Whereas the original AtticFoil® is micro-perforated (done with tiny pin-holes – seen on the left of this photo), the SuperPerf™ is punch-perforated, meaning an actual piece of the foil (quite small) is punched out and removed (seen on the right side of the photo). This is just like the idea of using a tiny hole-punch on a piece of paper. The result is an extremely breathable radiant barrier foil that still offers you great coverage and protection from radiant heat gain/loss. If moisture concerns were keeping you from looking more seriously in to adding a radiant barrier on top of your existing attic insulation, I encourage you to give the new SuperPerf™ a try. I’m confident you’ll feel good about using a product that was specifically designed with cold climates in mind by a trusted leader in the radiant barrier industry. If you have any questions about the new SuperPerf™ or if you’d like to get your hands on a sample of it, feel free to contact us or request our sample packet online. Due to an overwhelming response in using our radiant barrier foil in roofing applications, we now have a new website for all roof-related applications of our radiant barrier foil: www.RoofingFoil.com. RoofingFoil™ is the same strong, quality, tear-proof material that we have always offered and it works under any metal or tile roofing system as long as there is an air gap one one side of the foil. This means your standing seam metal roofs, your tile roofs that sit on batten systems or curved tiles, and any other brand that incorporates an air gap is a perfect application for RoofingFoil™! Make your Garard or Decra steel roof an energy efficient COOL ROOF! Regardless of what type of metal or tile you choose, including color, the radiant barrier will REFLECT 97% of the radiant heat from the sun from getting through the roof and into the home. No other product on the market can offer these kinds of proven results. Watch the video below to find out more info on how easy this installation is, and why it’s taking the roofing industry by storm! Then, checkout www.RoofingFoil.com for our other videos including Why Every Metal and Tile Roof Should Have A Radiant Barrier and Should I Install A Vapor Barrier Radiant Barrier In My Metal Roof? If you have a roofing application that you are considering but aren’t sure if RoofingFoil™ would be a good fit – ask us! You can visit the new website any time at www.RoofingFoil.com or, if you still have questions, we’re just a phone call or email away. 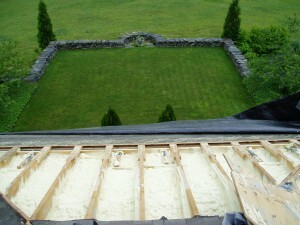 Q: Can I install radiant barrier if I have spray foam up on the rafters of my attic? How does AtticFoil work with spray foam? 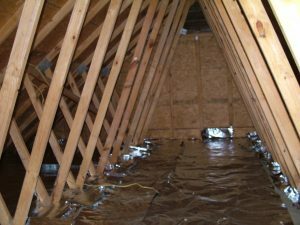 We get this question a lot – someone is usually in the process of new construction and they want to incorporate both the AtticFoil radiant barrier AND some spray foam in their attic space. First, I’d like to say that the two products compliment one another very nicely. Foam isn’t going to perform like radiant barrier because (like traditional insulation) foam slows conductive heat gain/loss, but it doesn’t actually stop it. Radiant barrier foil is different than spray foam because AtticFoil’s reflectivity of radiant heat is 97%, meaning you stop the heat from ever even entering the home. That being said, The foil is most effective at this when it’s closest to the outside layer of the home. For this reason, adding the foil with the required air gap it uses, can be tricky. There are several ways to go about this. First, you could use a traditional Cathedral Ceiling Method for Installing Radiant Barrier. In that case, you’d have some spacers added to the bottom of the roof deck, then the foil, then an intermediate layer like foam board, then spray foam over the foam board. The reason for the intermediate layer is because in many cases, the spray foam does not attach well directly to the pure aluminum radiant barrier. The roof decking is being laid on (or replaced) and you can clearly see that the foam in between each rafter cavity leaves a small air gap between the foam and the deck itself. 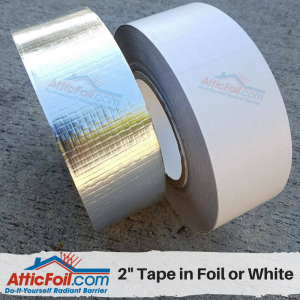 AtticFoil radiant barrier only requires a 1/2 to 3/4″ air space in order to work effectively; in this situation, you could run the foil across the top of the rafters and staple it down before new decking way laid on top. Another option would be to attach the foil directly to the bottom of the decking (or use a pre-manufactured radiant barrier decking) and then lay the decking down, with the foil facing the small air gaps. This is a perfect example of using radiant barrier and spay foam together and this is an ideal installation because the foil will serve as the first line of defense, reflecting 97% of the sun’s radiant heat from entering the layers below the foil and then the little bit of heat passing through the foil will covert to conductive heat and the spay foam will significantly slow down the transfer of the conductive heat into the attic and/or home as your second line of defense. Q: What about adding the foil from the inside, below the rafters filled with spray foam? For blocking heat (ie. summertime benefit) the foil is not going to offer much benefit being placed that far inside the envelope. There might be some benefit for heat retention in winter, since the foil would be right near the heat leaving the interior of the home, but generally people are adding foil to roofs/attics with spray foam because they are trying to lighten the heat load in the summer, even if they also want the benefit of keeping heat in during the winter. Bottom line: for a situation where you want to stop heat gain and/or you are looking for year-round benefit from the radiant barrier foil, it’s best to place the foil closest to the exterior of the home/building. I’ve talked about attic ventilation issues before, in fact it’s probably one of the most popular posts on the blog to date. In that article I touch on this issue and in this video I decided to go a little more in depth based on the frequency this problem comes up in conversations. What do you think? Is this a problem you’ve personally experienced in your attic? Did you have situations like the examples in the video? Tell me about it in the comments! Subscribe to the AtticFoil YouTube channel and never miss another video update. With the increasing interest of radiant barrier in commercial applications, and the amazing results from installing it in non-conditioned and conditioned spaces, it was only a matter of time before we would need to have a separate space online for these applications. Thus, WareHouseFoil.com was born! WareHouseFoil.com is a site that is 100% dedicated to non-residential applications for radiant barrier foil. Unlike AtticFoil.com where we address residential installs, WareHouseFoil.com focuses on metal buildings, wood sheds, barns, commercial warehouses, airplane hangars, and any other structure used for commercial purposes. The site features photos, installation instructions and tips as well as videos. If you have a commercial application that you are considering using radiant barrier for to address heat gain/heat retention, start by visiting www.WareHouseFoil.com, if you still have questions, we’re always a phone call or email away. People often ask me, “How does (insert brand name here) compare to AtticFoil® Radiant Barrier?” As a response, I decided to make this video to compare AtticFoil® with a brand sold in local home improvement stores, ie. Home Depot and Lowes, called Enerflex® Radiant Barrier. There are two main differences between the two that have an impact on your decision of which one to purchase. I think the differences are pretty clear. Now, tell me which one you’d rather have in your attic? The big concept is you’re trying to get a piece of radiant barrier foil between the roof and the insulation; the goal for heat rejection in the summer being to keep attic insulation cooler by preventing it from absorbing radiant heat from the roof. In this video I will explain it as quickly and concisely as I can. Get the foil between the insulation and the roof line. Staple it up across the rafters; it doesn’t have to be smooth or pretty. You can use 48″ wide radiant barrier foil to work horizontally, or 26″ wide radiant barrier foil to work vertically. The staples are standard size – 1/4 or 5/16th size work fine. Cover as much as possible; the more space you can cover, the better your results. Even partial coverage works! 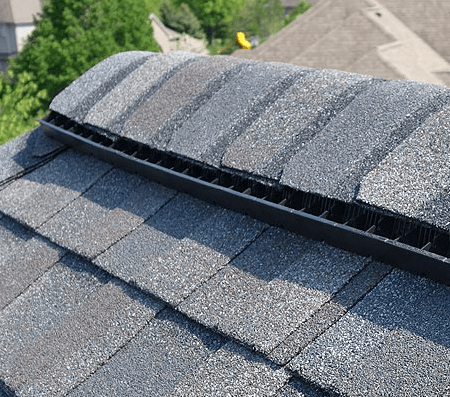 Allow ventilation a free path to flow in to the attic from down low at the soffits and escape the attic up high, near the ridge (via a ridge vent, gable vent, attic fan, etc.). If you would like to see some photos of finished installs, I recommend you take a look at these Do-It-Yourself radiant barrier foil installation photos. Still have questions? Leave me a comment below! How does TechShield® compare to AtticFoil®? I get this question just about everyday. 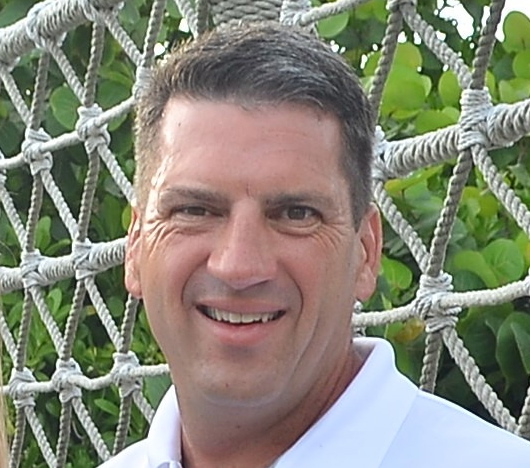 First, what is Techshield®? Techshield® is a roof decking material – usually OSB that has a sheet of aluminum foil laminated on one side. Techshield® is made by LP Building Products or Louisianna-Pacific Corporation and is probably the most popular brand of radiant barrier decking. Other brands are Solarboard by Norbord and Thermostat by Georgia-Pacific. Products like TechShield must have the foil side facing toward an open air gap, like an attic space. The main difference between Techshield® and AtticFoil® is that Techshield® is used almost exclusively for new construction or whenever a roof deck is being replaced. AtticFoil® is most commonly used inside the attic of existing homes. For most new construction projects, I recommend using TechShield® (or another brand). The products work well, the cost of upgrading from regular OSB decking to radiant barrier decking is pretty minimal and there is NO additional labor cost since the Techshield® is installed just like a regular OSB roof deck. 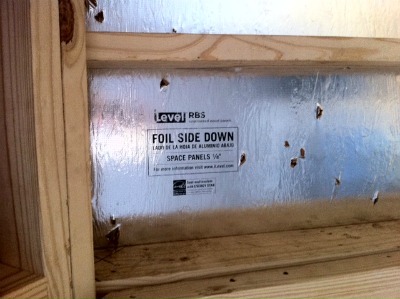 The foil side MUST face the attic air space (foil facing DOWN). If you install the foil facing up and then put roofing felt and shingles on top, you will get NO benefit. Do they work the same? Yes and No. Techshield® works off a quality called EMISSIVITY. Basically, this is the ability to NOT convert energy to radiant heat. The roof deck will get hot and would normally want to emit radiant heat both upward and downward. By putting the foil on the bottom of the roof deck, it greatly reduces the ability of the deck to radiant heat downward. This is similar to taking two HOT baked potatoes and wrapping ONE with foil. The potato with foil will stay hot longer since the foil will reduce or slow down the amount of energy (heat) emitted. If you were to wrap only half the hot potato with foil, then you have something similar to TechShield®. In this case, the potato would emit more heat upward through the area without foil compared to the side with foil. By reducing the heat emitted into the attic, this causes the attic contents (wood, insulation, framing) to be cooler. Combined with adequate attic ventilation the attic air temperature will also be significantly cooler. AtticFoil Radiant Barrier draped under a new roof deck. AtticFoil® works off the quality of REFLECTIVITY since there is an airspace between the source of heat (the roof deck) and the foil. The radiant heat is STILL emitted by the roof deck, but hits the foil and is reflected back keeping everything below the foil cooler since the items never get a chance to absorb the radiant heat coming off the roof. Don’t worry about overheating the roof deck – it will only increase between 2º-10º degrees. By stapling to the bottom of the rafters, you will usually achieve a greater reduction in overall BTU’s coming into the attic compared to radaint barrier decking. Can I make my own radiant barrier decking like TechShield using AtticFoil®? You can and it is VERY easy! Simply roll AtticFoil® Radiant Barrier foil out on standard 4’x8’ sheets of OSB or plywood. Then use a hammer staple and ¼” staples to tack it down. When installed over the rafters it will jut like a piece of radiant barrier decking. Or, if you want to install a radiant barrier for new construction, you can run the foil across the rafters and let it “droop” down about 4-5” between the rafters. 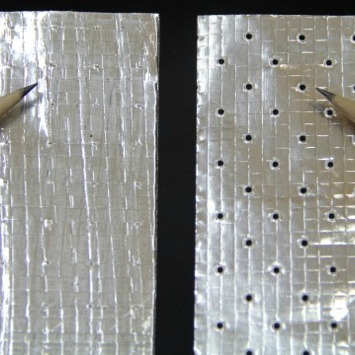 By doing this method, the AtticFoil® will work off the reflectivity quality compared to the emissivity quality of foil. Be sure to leave a gap at the top and bottom of each rafter run for air to find its way up and out of the attic.